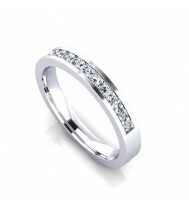 Diamond Wedding Rings There are 9 products. Traditionally, lady's wedding rings are plain however more and more women choose to have one or more small diamonds set into the band, whilst some prefer to have them all the way around. We offer a wide selection of diamond wedding rings set with brilliant cut diamonds, princess and fancy cut diamonds, all designed around you. 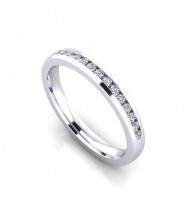 Ladies diamond set eternity ring, this 2.9mm wide eternity band has a court profile and set with 10 round brilliant cut and 4 baguette diamonds. The total diamond weight is 0.30ct approx. This is a bespoke design, please call or email us for a price based on your own requirements. 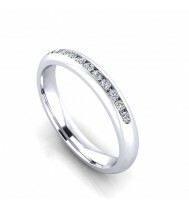 Ladies diamond set eternity ring, this 3mm wide eternity band has a court profile and set with 11 round brilliant cut diamonds. The total diamond weight is 0.15ct approx. This is a bespoke design, please call or email us for a price based on your own requirements. 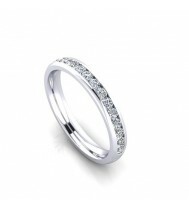 Ladies diamond set eternity ring, this 3.7mm wide eternity band has a court profile and set with 12 round brilliant cut diamonds. The total diamond weight is 0.70ct approx. This is a bespoke design, please call or email us for a price based on your own requirements. 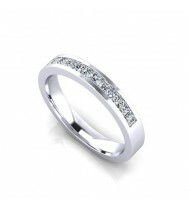 Ladies diamond set eternity ring, this 2.5mm wide eternity band has a heavy D shape profile and set with 13 round brilliant cut diamonds. The total diamond weight is 0.60ct approx. This is a bespoke design, please call or email us for a price based on your own requirements. 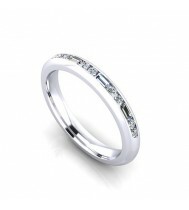 Ladies diamond set eternity ring, this 2.6mm wide eternity band has a court profile and set with 17 round brilliant cut diamonds. The total diamond weight is 0.18ct approx. This is a bespoke design, please call or email us for a price based on your own requirements. 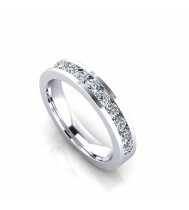 Ladies diamond set eternity ring, this 2.9 mm wide eternity band has a court profile and set with 18 round brilliant cut diamonds. The total diamond weight is 0.40ct approx. This is a bespoke design, please call or email us for a price based on your own requirements. 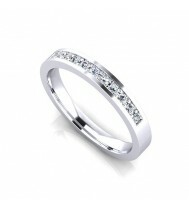 Ladies diamond set eternity ring, this 3mm wide eternity band has a flat court profile and set with 10 princess cut diamonds. The total diamond weight is 0.50ct approx. This is a bespoke design, please call or email us for a price based on your own requirements. Ladies 18ct White gold Eternity ring, this 2.9mm wide eternity band has a flat court profile and set with 11 round brilliant cut diamonds. The total diamond weight is 0.25ct approx. This is a bespoke design, please call or email us for a price based on your own requirements.